There's a contractor in the Quad Cities who is committed to helping homeowners achieve their visions of the perfect living spaces. From room additions to finished basements, Carr Construction has the experience and talent to turn your dreams into functional and sophisticated realities. Recognized by the National Association of Home Builders as a Certified Graduate Remodeler, Tim Carr has the know-how and experience to tackle even the most challenging remodeling jobs. With Tim Carr Construction, Inc. you have a contractor who works closely with you to meet and exceed all expectations. Expertise includes designing and building room additions, finishing basements, and total house renovations. The craftsmen at Tim Carr Construction deliver quality work at the price and on the date promised, and with the outcome you expect. Maybe that's why Tim Carr Construction was the first recipient of the Quad Cities Home Builders & Remodelers Association’s Remodeler of the Year award. As a full-service residential remodeling contractor, the company employs the proven design-build process, where contractor, architect, and designer work as one unified source—the design/build Contractor. 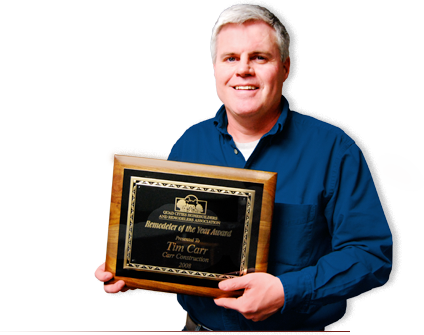 Tim Carr Construction was the first recipient of the Quad Cities Homebuilders and Remodeler Association Remodeler of the Year Award. contractor in the Quad Cities area.